Aliens in human disguise commandeer a rural airport during a snowstorm. To survive, the people trapped inside must determine which of their own is not of this Earth. On a stormy night, while transporting a criminal named Jack to death row, the officers have a car accident near a private airport. They bring the prisoner to the airport where clients are arguing with the owner/pilot of the charter services, Cathy Garrett because she refuses to take off with the bad weather and the communications are down due to the snow storm. Jack asks to go to the toilet being escorted by the guards; however, in the bathroom, a preacher attacks and kills the guards and when Jack kills him, his body vanishes. Jack returns to the lobby and when the security guard holds him, he accidentally shoots a passenger, but the woman does not die until Jack shoots her in the head and her body also disappears. The survivors conclude that they are trapped in a place filled with aliens and nobody can be trusted. 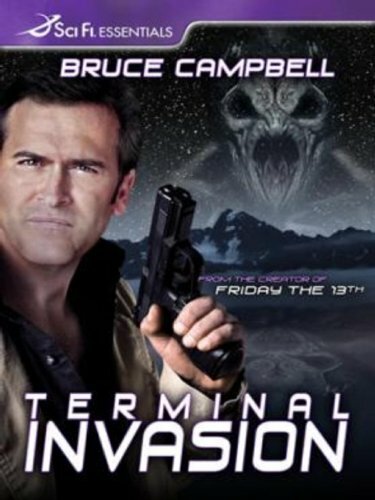 TERMINAL INVASION features Bruce Campbell as a convicted felon who along with a few other people become trapped at an airport due to bad weather, but what he is about to realize is that not all the people at the airport are who or what they appear to be. This film was actually entertaining, of course its nothing you would go and tell everyone about but for me it was a good movie, the acting wasn't perfect I won't argue there but it was above par compared to films in the same standard, the storyline although sometime uneventful had its moments by having a few clever plot twists here and there. I would recommend this film to people that at times might feel like they want to watch a movie but don't know which one, its not a big budget effects feast but it'll pass the time, try it out even if you're not a genre fan. Mostly predictable with a few surprises. Not a bad film, but not a great film. Acting was ok, aliens looked fairly real, would have looked better on a big screen. The way the aliens died looked a lot like they did on that TV show about the alien invasion called First Wave. Good surprise ending. But still a B type movie, but quite watchable.